Is this the Biggest Mac? Let me tell you a secret: not all Macca's are created equal. Some live long and prosper; others bend to the tumbleweed blowing through country towns and close their doors forever. You may think that a sip of drink or an ice-cream slurp is the same under any golden arch – not true. One Macca's rules them all. Set in the smallest suburb of the sleepy mining town of Ballarat, Bakery Hill Macca's is an old multi-level building whose floors step up the side of the hill. Who says it's the largest? I for one haven't measured, but the legend lives on and the expansive dining rooms (that's rooms, plural) certainly suggest it. As any local will proudly announce as you stop for directions "oh, Bakery Hill? Yeah just up that way mate. 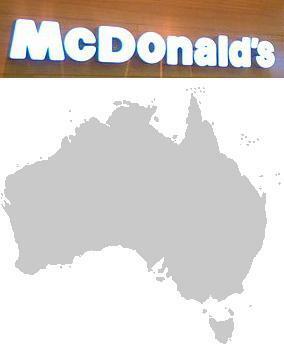 Largest Macca's in the southern hemisphere you know." And then they'll stare at you until you nod, assuring them you've absorbed the gravitas of the last statement. The largest. Perhaps it's that Ballarat hasn't had much to be proud of in a while. Let's admit it, we peaked a bit early with the whole gold rush thing. Now like moths to a flame we turn to the next big shiny yellow thing, that 'M' of magnificence, and claim its Mies-esque flowing spaces and simple interiors as our own personal discovery. Like Daryl and his castle, those golden arches, grimy floors and strange greenhouse-esque garden near the toilets somehow bring out a local pride rivalled only by our claim to Victoria's best chips and gravy. Bakery Hill Macca's elevates the common bogan to new heights. With the dress du jour a singlet and trackies, it might be said that this Macca's reaches for quantity rather than quality. The carpark is certainly not a place you'd want to be hanging around in during the early, post-party hours – perhaps this is why the seats slowly fill. It is at this time Bakery Hill Macca's is at its finest; a beacon of harshly gleaming light and standardised chairs to the drunk and bedraggled, using stale sweat and the borrowed glory of dance floor victories to beckon to those whose Saturday night has faded once again. Only one remnant of the daytime crowd remains; a lone pickle sliding down the window, losing the race. So, largest? Really? The jury – and the ruler – are still out. Nothing to be proud of..i remember there was a huge uproar when McDonald 's were to open on historical site. of Bakery Hll. Noone wanted it there.